From the writing of the late Howard Ash much of this following article has been gathered. 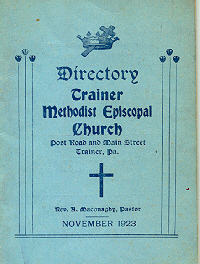 The Methodist Church at Trainer, Pa., had its beginnings around 1890 and was the result of cottage prayer meetings held in various homes in the mill village. These meetings were led by Methodists from South Chester and Marcus Hook. A Sunday School had been established and had regularly conducted meetings in a small chapel on Main Street which belonged to the Trainer Family and was sponsored by David Trainer and Mrs. William E. Trainer, Sr. While Rev. E. H. Isett was pastor at Cokesbury Methodist Church in Marcus Hook, where the Trainer Methodists worshipped, a stirring revival was held in which a great number of people were added to the communicants from Trainer. Their number having increased they began to wish for a local place where they might worship. At that time they had no sidewalks and no streetlights. Therefore, persuasion was so strong, that Rev. Isett was successful in completing the purchase of a small section of land for the Methodists in Trainer at Main Street and Post Road. In the meantime a pastor was secured whose name was Rev. Samuel Pancoast who was a retired member of the Philadelphia Conference who lived in Chester. He served from February 1893 to August of the same year. He died as a result of an accident and was succeeded by Rev. John D. Rigg who served from September 1893 to March 1894. The Sunday School had been formerly organized during the pastorates of these two men and services were held in the chapel. A class also had been organized and a stalwart Methodist by the name of James T. Gill was appointed leader. At the session of the Philadelphia Conference in 1894 Rev. Benjamin F. Miller was appointed to Trainer Church as the first resident pastor. Services were still being held in the chapel. But the growing congregation began to work towards a home for themselves. Land having been purchased, they had plans drawn for a frame structure and parsonage. Ground was broken for the church building April 29, 1895 and the work was completed in August of that year. The congregation worshipped there until 1927. The Sinclair Oil Co. purchased land around the church property and began preparations for refining oil. This made it necessary for the Methodists to look around for another site. Under the pastorate of Rev. Alexander Maconaghy, a piece of land about 2 acres in extent was purchased from Miss Henrietta Johnson at Ninth and Price Sts. In November of 1925 Rev. Maconaghy began erection of a concrete block building where a Sunday School was organized among the families in Buckman Village and Lennox Park. It was used for 2 years for an afternoon Sunday School and for evening worship. On March 6, 1927, the offer of Sinclair Oil Company of $40,000 for the Post Road property was accepted by the congregation and plans were ordered drawn for a church and parsonage on the lot at Ninth and Price Streets. The plans of the Bureau of Architecture of the Methodist Episcopal Church were accepted. 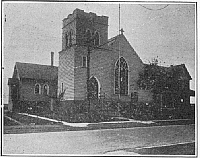 On July 2, 1927 a congregational meeting awarded the contract for the new church home to William Provost, Jr., of Chester and the ground was broken August 23, 1927. Rev. Clarence B. Felton was pastor during the sale of the Post Road property and the erection of the church home on Ninth Street. The cornerstone was laid on October 16, 1927. Work progressed without interruption and the beautiful church and parsonage was finished by the end of April, 1928. Dedication of the artistic church entirely furnished together with a pipe organ was on Sunday, May 6th, 1928 when the sermon was delivered by Rev. Alpha G. Kynett, D.D., Philadelphia. The building committee consisted of Harry E. Grubb, Olin R. Plummer, Sr., William G. Nealy, Addison T. Wells, Frank H. Leake, all trustees. The pastor, Rev. Clarence B. Felton, assisted the committee. This beautiful edifice with its parsonage is built of Cynwyd stone and is considered one of the beautiful churches in the Eastern Pennsylvania Conference of the United Methodist Church. So much was thought of it that officials in December 1928 sent pictures, plans and specifications and entered into competition with other churches in the first annual church building competition sponsored by the Christian Herald. There were 44 entries from 20 states. The jury of three outstanding architects of the country awarded the first prize of $1,000 to Trainer Church, the amount divided equally between church and architects. No major additions were added until December 1953, when several garages and the room known as the Upper Room were built. Plans for the proposed Educational Building were begun under the leadership of the Rev. Gordon L. Clark, Pastor of the Church from 1956 to 1962. The building was completed around 1964 during the ministry of Rev. Albert N. Frank who served the: church from 1962 to 1968. The mortgage for this building, which is now known as "Wesley Hall," was paid off in 1975 during the ministry of Rev. William McClain, who served the church from 1970 to 1975. The mortgage burning ceremony was held in April of 1976 during the pastorate of Rev. Afred Vardall, the present pastor. Young Adult Member of the Council on Ministries-Charles Books,, Jr.
Representative of United Methodist Youth Ministries-Robert Books. In February 1949 Howard E. Ash was honored for 50 years of service as Sunday School Superintendent at Trainer Methodist Church. Mr. Ash was a retired printer and a former official of Trainer Borough. Abrams, Grace ............................ Chester, Pa.
Abrams, Millie ............................ Chester, Pa.
Ambrose, Susan ............................ Chester Pa.
Atkinson, Clarence ........ 12 E. Delaware Ave., M.H. Atkinson, Lucy .. ........... 12 E. Delaware Ave., M. H.
Battis, Jeremiah .......................... Linwood, Pa.
Battis, Mrs. Jeremiah .................... Linwood, Pa.
Battis, Elizabeth .......................... Linwood, Pa.
Bennett, Jennie ..... .................... 8 Plaza, M. H.
Boles, Mildred ............................. Chester, Pa.
Booth, Jeanette M . ... .......... ......... Linwood, Pa.
Brown, A. J . ......................... Marcus Hook, Pa.
Carr, Henry .............................. Chester, Pa.
Carr, Sadie ............................... Chester, Pa.
Cochrane, Edna A . .......... 1203 Keystone Road, B. V.
Cochrane, Robert W . ........ 1203 Keystone Road, B. V.
Cohee, Anna ........................ 6 Spruce St., M. V.
Devlin, Ella M . ..................... Marcus Hook, Pa.
Devlin, Luccy E . .................... Marcus Hook, Pa.
Devlin Mattie Marcus Hook, Pa.
Downes,.Edith 17 Walnut St., M.V. Downes. Hettie .................. 17 Walnut St., M.V. Downes, . E . .................... 17 Walnut St., M. V.
Downes, Leon ..................... 17 Walnut St., M. V.
Dressley, Frank E . .......................... Chester.. Pa.
Dill, Martha .......................... Maple St., M. V.
Foster, Elsie St., M. V.
Furness. Olive M . ................ 46 Cedar St.. M. V.
Gaynor. Alonzo B . .................. 39 Cedar St., M. V.
Gaynor, Emma .................... 39 Cedar St., M, V.
Gray, Lillie ................................ Trainer, Pa.
Harper, Hiram ............ 1905 W. 4th St., Chester, Pa.
Harper, Katherine ........ 1905 W. 4th St., Chester, Pa.
Harris, F. M . ........................ Marcus Hook, Pa.
Harris, Ida ........................... Marcus Hook, Pa.
Harrison, Clara G . ...................... 7 Plaza, M. V.
Harrison, George E . .................... 7Plaza, M. V.
Harrison, Nellie B . ...................... 7Plaza, M. V.
Harrison, Norman F . .................... 7Plaza, M. V.
Hawkins, Emma ............................ Chester, Pa.
Hawkins. Frank .......................... Chester, Pa.
Hyde, Ida .......................... 9 Cedar St., M. V.
Hyde, Mrs. Amy .................. 36 Cedar St., M. V.
Hyde, Russell E . .................. 36 Cedar St., M. V.
Ingram, Helen ................ Center Ave. and Smith St.
Jenkins, Annie E . .......................... Trainer, Pa.
Jones, Mary E . .................. 6th St., Chester, Pa.
Jester, Annie ...................... 29 Cedar St., M. V.
Jester, Elijah M .................... 29 Cedar St., M. V.
Kiel, Agnes ............................... Bayfield, Wis.
Killen, Effie .............................. Kingston. Pa.
Lewis, Ida ..................... 16 Chestnut St., M. V.
Lewis, W. A . .................... 16 Chestnut St., M. V.
Lilley, Mrs. Ellsworth .............. 40 Cedar St., M. V.
Logan. Blanche ............................ Chester, Pa.
McCay, Jennie ........ 206 Hillside Ave., Jenkintown, Pa.
Meade, Milda .............................. Chester, Pa.
Meade, Eva ...................... 20 Walnut St., M. V.
Pinder, Sadie ..................... 23 Walnut St., M. V.
Pinder, Wm. 23 Walnut St., M. V.
Pusey, J. H. 12 Chestnut St., M. V.
Pusey, Mary E. 12 Chestnut St., M. V.
Reed. J. M . ........................ 620 10th St., M. V.
Reed, Orah ........................ 6 Spruce St., M. V.
Smith, Anna ........................ Yates Ave., M. H.
Smith, Edna ......................... Yates Ave., M. H.
Smith, Mabel R . .................... Marcus Hook, Pa.
Sparklin, Florence .................. 10 Maple St., M. V.
Sparklin, Helen .................... 10 Maple St., M. V.
Stewart, Kate ........................... Chester, Pa.
Stillie, Iva ........................ 39 Cedar St., M. V.
Straughn, Leroy .................. 22 Spruce St., M. V.
Taylor, Mrs. M . .................. 34 Cedar St., M. V.
Trader. Charles B . .............. 29 Chestnut St., M. V.
Trader, Cornelia ................ 29 Chesntut St., M. V.
Turner, George ............. 10l Park Place, Chester, Pa. Walls, Anna .............. Linwood Heights, Pa.
Walker, Elizabeth ................ 24 Walnut St., M.. V.
Walker, Rowland ................ 24 Walnut St., M. V.
Watkins, Earnest ................ Linwood Heights, Pa.
Wallen, Morris E . .................... Marcus Hook, Pa.
Wood, Elizabeth ........................... Plaza, M. V.
Wood, Margaret .......................... Plaza, M. V.
Wood, Samuel ............................ Plaza, M. V.
Young. Reba .................. E. Delaware Ave., M. H.
� 2000, 2002, 2004 John A. Bullock III.